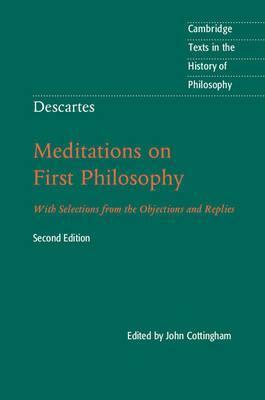 Descartes's Meditations on First Philosophy remains one of the most widely studied works of Western philosophy. This volume is a refreshed and updated edition of John Cottingham's bestselling 1996 edition, based on his translation in the acclaimed three-volume Cambridge edition of The Philosophical Writings of Descartes. It presents the complete text of Descartes's central metaphysical masterpiece, the Meditations, in clear, readable modern English, and it offers the reader additional material in a thematic abridgement of the Objections and Replies, providing a deeper understanding of how Descartes developed and clarified his arguments in response to critics. Cottingham also provides an updated introduction, together with a substantially revised bibliography, taking into account recent literature and developments in Descartes studies. The volume will be a vital resource for students reading the Meditations, as well as those studying Descartes and early modern philosophy. Introductory essay Bernard Williams; Introduction; Chronology; Meditations on First Philosophy; Selections from the objections and replies; Index. John Cottingham is Professor Emeritus of Philosophy at Reading University and an Honorary Fellow of St John's College, Oxford. He is the author or editor of many books, including Descartes (1986), The Rationalists (1988), Cartesian Reflections: Essays on Descartes's Philosophy (2008), The Cambridge Companion to Descartes (Cambridge, 1992) and Western Philosophy: An Anthology (1992).